Perched on the border between civilized ghoulkind and the chaos of the barbaric slickskins, the zombie sheriff must rescue his kidnapped friends from the dastardly McFarland and his notorious gang of outlaws. He assembles a posse of the most talented zombies around, including Mungo, a zombie chef interested in locally sourced ingredients; Bub, a barber whose enormous strength somewhat makes up for his complete lack of intelligence; and Dr. Callahan, a would-be pacifist who reattaches misplaced limbs with gusto. As the posse tracks McFarland, they soon realize they themselves are being pursued. The ever-courteous Abernathy Jones, as quick with his business cards as he is with his deadly cane, is out to settle an old score from the sheriff's prezombie past, though exactly what he wants is anyone's guess. Even more troubling, the sheriff begins to hear rumors that the true reason for his friends' abduction is to provide test subjects for the sadistic experiments of the mysterious Dr. Gimmler-Heichman. 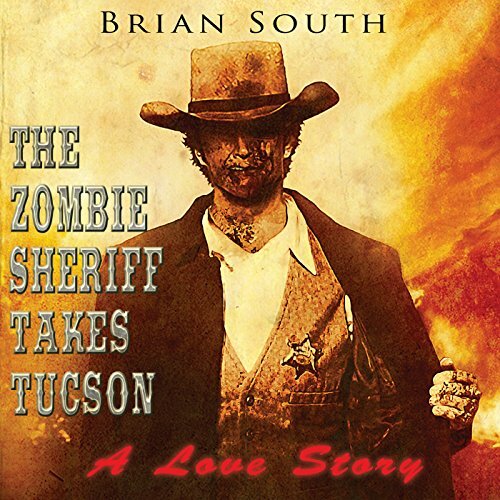 The Zombie Sheriff Takes Tucson: A Love Story is the absurd, tongue-through-cheek tale of reanimated cowboys, undying love, and the lengths to which one zombie will go for justice. And for brains. For the most part, in the genre of Zombies, they are supposed to be single-minded, brain and flesh seekers and eaters. Mostly anyway! Brian South creates a new world where the zombies are actually the victims of a gang of bounty hunting outlaws who hunt zombies for their leader to experiment on. Add in the old west, a famous (now a zombie) lawman, and a town of ghouls. The Sheriff gathers the most skillful “zombie” town residents together and they go after Chester’s Brigade and McFarland – humans who hunt and kill zombies for sport and money. Jezebel, a female zombie who is being held prisoner for the experiments by the humans captures the heart of the sheriff who is driven to find her and rescue her. South does an excellent job of building up each character both main and not as they all play an important role. Vivid in his descriptions one cannot help but be sucked into the tale and see what is developing with each page. South draws the reader in with his ability to tell a story with vivid rich imagery. By the time you finish the book it is as if you have actually met and rode with the characters. The plot is that of an old western – save the girl and the town while ridding the world of the bad guys. That’s it though! There’s no question of saving the world or beating back hordes of zombies to survive. These zombies don’t really bother slick-skins except to serve them up as delicacies! This is a wonderful tale of zombies – light, fun and witty. Taking the theme of the old spaghetti westerns – sheriff vs the bad guys, rescues the damsel and the town – and mixing it with the zombie genre one has a delightful tale that captures the imagination and tickles the funny bone. Imagine zombies on horses! How do they ride them without eating them? Lots of willpower and even then it’s not always doable. This book was enjoyable for several reasons – a new approach on zombies, the zombies being personified giving one a glimpse into who they once were and are now, how easily it is for humans to attack and kill things they do not understand, and that there is even love among the walking dead! If you are looking for a horror filled, flesh ripping zombie book – this is not it. South does not explain how the zombies came to be or why there is even a town of them left to lurk in or the lack of Native American Indians. He does however explain how zombies understand one another – the language of zombies is zombie-eese. The narrator, Rich Miller, was good as he kept the book flowing with an easy tone. His pronunciation was solid and his voices were ok. Not many men can do female voices well.